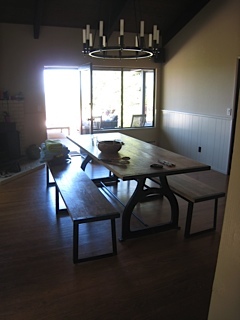 I designed this dining room table and benches using almost all reclaimed wood and items. It has a magic and relaxed feeling about it. Everyone gathers here and the piece fits into the space as if it has been there for ever. It can seat 10 comfortably and is perfect for holidays. Most clients think they can not afford custom made furniture but this table was less then a new equivalent with design time and designer discounts passed onto the clients. One more reason why working with a designer on projects can be a good idea!